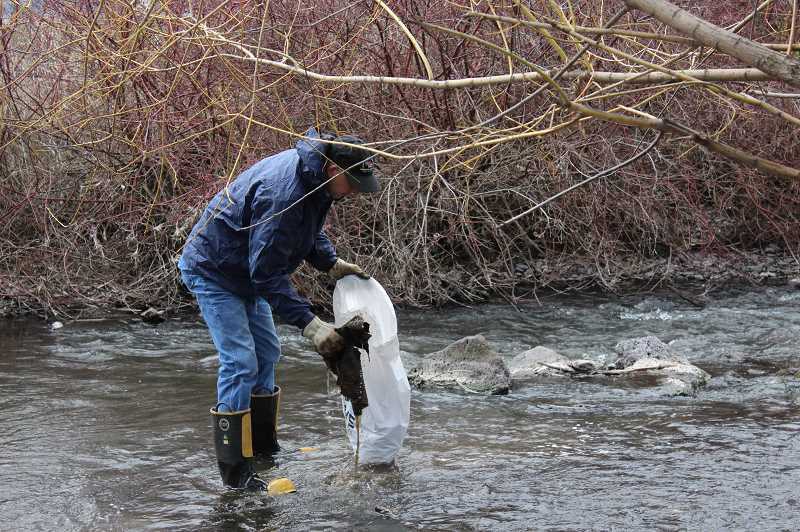 More than four miles of Ochoco Creek were cleaned during the Rotary Club of Crook County's second annual Ochoco Creek Cleanup event on Saturday, April 6. Forty adult volunteers and 18 youth assisted in removing trash from the old Ochoco Lumber Company site to the confluence with the Crooked River. The event was rescheduled due to snowy conditions in February, leaving many past volunteers unable to attend. "We were thrilled that we were able to expand the length of stream cleaned this year in spite of the date change," said Carol Benkosky, event coordinator. "Again this year, we filled a 10-cubic-yard dumpster with trash removed from the bed and banks of Ochoco Creek." In addition to the usual assortment of plastic cups, bags and food wrappers, crews also worked in teams to remove plywood, sporting equipment, tires and even a toilet. Volunteer teams of four to six people, with at least two individuals in hip or chest waders, were assigned different clean-up segments. Groups who assisted this year included members of the Crook County Rotary Club and Crook County Search and Rescue, employees from Apple Inc., volunteers from the Deschutes Land Trust and Central Oregon Fishermen, Prineville Police Officers, retired federal employees, concerned citizens, and an entire troop from the Crook County High School NJROTC and their commanding officer. Benkosky thanked Crook County Parks and Recreation for providing three employees to collect the garbage and deposit it in the dumpster. Prineville Disposal provided the dumpster, and the Crook County Court donated the tipping fees at the landfill. Ochoco Brewing Company provided the after cleanup celebration.